Saint Catherine of Siena - My Catholic Life! Saint Peter was not martyred in Frankfurt, Germany; Alexandria, Egypt; or Jerusalem. He could have been. God, in His Providence, wanted Saint Peter’s blood to spill on Roman soil, so that His One, Holy, Catholic, and Apostolic Church would drop anchor in the then capital of the world. This does not mean that Catholicism is bound to St. Peter’s Basilica and Rome in the same way that Judaism was bound to the temple and Jerusalem. Rome does not have the same theological significance for Catholics as Jerusalem does for Jews, nor is Rome the successor of Jerusalem. Rome is not a holy city like Mecca is for the Muslims. That the primacy of the Pope over the universal Church is rooted in his being the successor of Saint Peter is an indisputable theological and historical fact. However, the Petrine ministry is one thing, and where it is exercised is another. The location of the Petrine ministry has never had the same theological weight as the ministry itself. Peter, yes. Always. Rome, yes. So far. Mostly. Today’s saint was a Third Order Dominican, a mystic, a contemplative, and an ascetic who used secretaries to compose her letters, because she could not read or write until the last few years of her life. 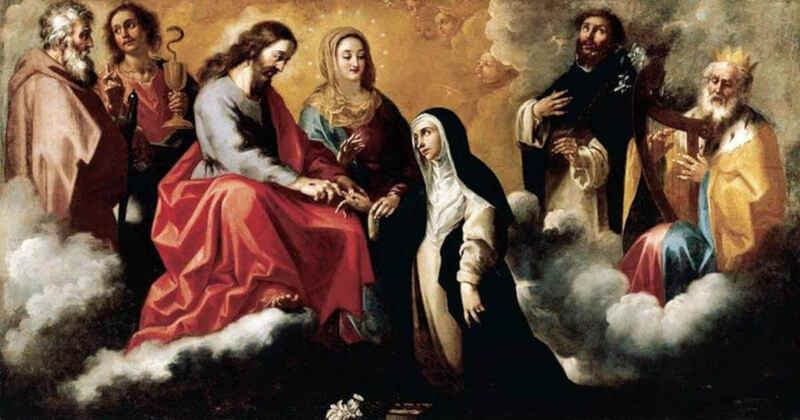 Yet for all of her interior distance from the world and its concerns, Saint Catherine of Siena threw herself at the feet of the Pope, then reigning in Avignon, and begged him to return to Rome. The “Babylonian Captivity” of the papacy in Avignon had gone on for almost seven decades and caused grave scandal. The move to Avignon was not due to an irreversible cultural shift such as a Muslim conquest or a decimating plague. The popes did not abandon Rome because it was a carcass. The transfer of the papal court to Avignon, a city within the Papal States, was the result of politics. It is not often that a single person can affect the course of history as much as a battle, a treaty, or a Council does. Incredibly, though, Saint Catherine of Siena’s efforts to return the papacy to Rome were successful. She wrote so powerfully, spoke so passionately, and exuded such intense holiness that the Pope was overwhelmed. She also seemed to have prophetic powers, even knowing what the Pope was thinking or had previously thought. She was frighteningly intense. Saint Catherine could not be ignored. Thus, sixty-seven years of seven French Popes ruling far from Rome ended. In 1376 Pope Gregory XI abandoned Avignon and followed in the footsteps of so many medievals—he went on pilgrimage to the tomb of St. Peter. And he stayed. The eternal city was a widow no longer. Saint Catherine was born the twenty-fourth of twenty-five children in a pious family imbued with the love of God. She eagerly drank in all that her parents poured out. She went for true “gold” early in life. She practiced extreme penances, eating only bread and raw vegetables and drinking only water for her entire adult life. She conversed with God, experienced ecstasies and visions, and dictated hundreds of letters and books and reflections filled with the most profound spiritual and theological insights. In 1970 she was the first layperson, and first woman, to be made a Doctor of the Church, in recognition of her profound mystical theology. Catherine died at the age of thirty-three, worn out by penances, travel, and the burden of her involvement in so many pressing ecclesial affairs. She was canonized in 1461. Her body can be seen in a glass coffin under the main altar of the Dominican Church of Santa Maria sopra Minerva in Rome. Her skull is found in her native Siena. 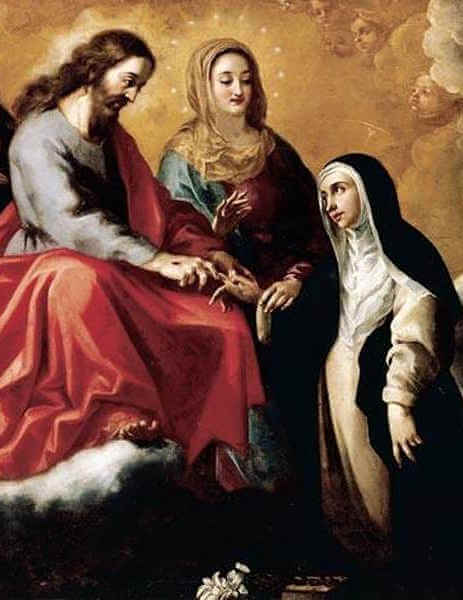 Saint Catherine of Siena, your love of God was expressed in so many vibrant ways and in a fervent love of His Church. From your exalted place in heaven, we seek your powerful intercession to make all Catholics more ardent in their love of the Trinity, of the Passion, and of the Papacy.